Stop Asking HowsTheJobs! What About the Employment of Gau Rakshaks, Trolls, and Anti-Romeo Squads? 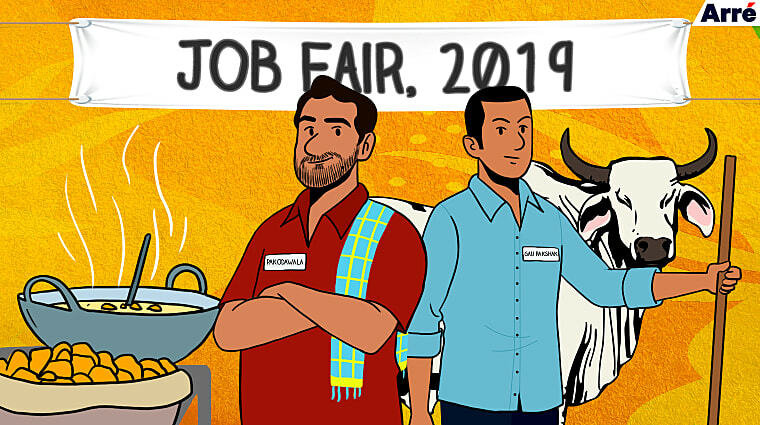 ntil last week, everyone was asking “How’s the josh?” Today we have a more pressing questions: #HowsTheJobs. Firstly, it should be, “Where are the jobs?” and secondly, all these unemployed people trying to defame the government need to get a job. This is nothing but yet another attempt by the presstitute media to malign Modi & Co over a study from the National Sample Survey Office that has been withheld by the government itself. When the Aadhaar data of millions of people is leaked, they complain that there is no security. Now when there is so much security that the government won’t even release its own survey, libtards are bubbling over in outrage once again. According to the NSSO survey, the country’s unemployment rate stood at a 45-year high of 6.1 per cent in 2017-2018. What a slap on the faces of people who say this government has not been able to do anything historic! But make no mistake, the NSSO is trying to fool us with facts, records, and evidence that might reflect the ground reality. But it’s been more than four years now and we are accustomed to scripted interviews, photoshopped WhatsApp forwards, and fake news. What significance do a few paltry official figures hold? These unemployment numbers are obviously fabricated. People at the Reserve Bank of India took years to count currency, so how are we expected to believe that officials can calculate employment figures accurately? The PM already pointed out a loophole in the methodology when he told us that pakoda-wallahs are never included in data collection. Do you know how many people crave pakoda and chai in the winters? Also, have the smart alecs at NSSO taken into account freelancers who spend 70 per cent of their day just sending follow-up emails asking for payment? I have my doubts. Now even Priyanka has taken up the job of a full-time politician. Aur kitne jobs chahiye? That said, the accusation that the government has failed to create jobs is ludicrous. In Uttar Pradesh alone, thousands of new jobs have been created over the last few years for gau rakshaks. The diversification in this particular job market is also remarkable – some people take care of cows while others beat up those who misbehave with cows. Then there are those who watch out for people smuggling cows. Just like food start-ups, this whole industry did not exist until a few years ago. Does Yogi Adityanathji not deserve the UN Best Employer Award, similar to our PM’s Philip Kotler Award? The BJP’s job creation programme is not restricted only to the animal rights department. The ruling party has also given opportunities to trolls to prove themselves by employing them in its IT cell. Does the party get no credit for providing jobs to dedicated people who clock in at 8 am every morning and begin name-calling, abusing women journalists, zeroing on anti-nationals, and hiding behind anonymous handles? These trolls don’t take sick leaves, or casual leaves; they work on weekends and public holidays. You will not find such dedicated employees anywhere, not even in media start-ups. Apart from these full-time jobs, even seasonal jobs have been created in the last few years. Valentine’s Day is approaching and Anti-Romeo Squads will be on high alert, beating up consenting couples and getting people forcefully married. Thousands of people with no future prospects now have the hope and faith that they can also do something in life, as long as there are enough hockey sticks to go around. In fact, by getting people forcefully married, the BJP has also generated business for caterers, tailors, and unemployed DJs, realising the PM’s dream of One India, One Market. But the BJP’s most important contribution might be its most understated. It has put to work a member of the Gandhi parivaar who was slacking around all this while. Now even Priyanka has taken up the job of a full-time politician. Aur kitne jobs chahiye? Stop with the NoMo Jobs nonsense, just because two members of the National Statistical Commission resigned after the the government was unwilling to release the report. Did you even know about the NSC until this morning?